I got 48 loaves done for my Xmas orders, and these are 12 extra loaves for those who missed out on the original ordering. I have a dear friend that owns a Fresh Fruit Bouquet place and she gave me space in her commercial freezer to store the loaves. These orders are being picked up there so she offered to do a mini Open House where a few of us will be selling pottery and a few other crafts. We have done a wee bit of advertising and so hopefully we will all sell some of our wares and make a few more people happy. I think I am crazy for having baked 60 loaves over a couple of weeks. On another note, you will see that I didn’t mill any flour for this recipe. I had a big bag of Wholewheat flour from the local miller so I decided to use that as it really is very good flour and I was feeling a tad lazy. I am still surprised at the amount of bran that I get out of his flour compared to mine. Take the 142 g of wholewheat flour for the levain and sift it to separate the bran. Reserve both for the levain. Take 3 g of starter and feed it 8 g of filtered water and 9 g of bran. Cover and let sit overnight. 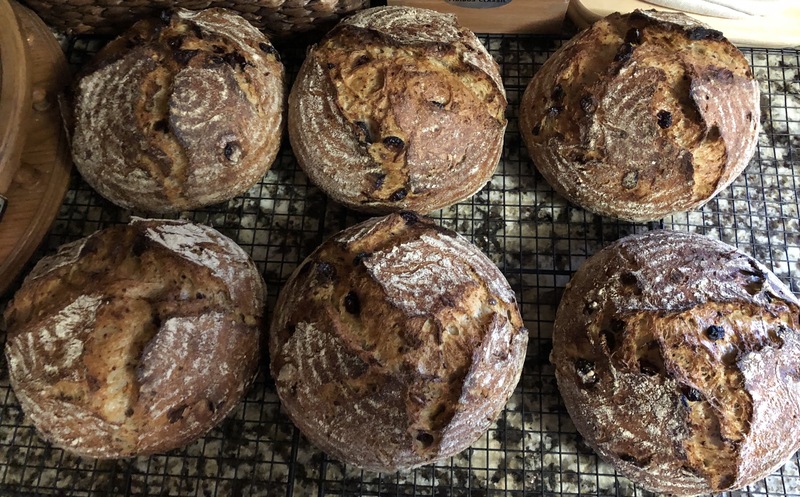 Feed your levain 15 g of filtered water and 19 g of bran/sifted flour. Sift enough wholewheat flour to get 188 g of sifted flour. Save the bran from this for bran muffins or another use. Place the 188 g of the sifted Wholewheat flour in a tub, add the unbleached flour and the freshly ground flax. Cover and reserve. Measure out 50 g of sunflower seeds and toast in a dry frying pan until fragrant and lightly toasted. Set aside. Before going to bed, feed the levain 31 g of filtered water and 38 g of the flour reserved for the levain. Feed the levain 61 g of filtered water and 76 g of the reserved flour. Let rise till double. This took 4 hours in my 73 F kitchen. Two hours before the levain is ready, add 770 g of filtered water to the tub with the flour and flax, and mix well. At this time, you can place the salt, the sunflower seeds, the cranberries and the feta on top of the dough and let it it there while the dough autolyses. Do not mix in! Let the dough autolyse for a couple of hours. Once the levain is ready, add the yogurt and the levain to the tub and mix well. Let rest 30-45 minutes. Do three sets of French slaps and folds at 30 minutes intervals. The first set has 70 slaps, the second set has 40 slaps and the last set has 10 slaps. I did add 15 g of water to the tub after the first set of slaps and folds because the dough felt a bit stiff. Continuing on 45 minute intervals, do another 2 sets of folds. Let rest an hour and a half in a warm spot (oven with lights on and door cracked open) and then retard the bulk for two and a half hours. The dough rose about 40%. Tip the dough out on a bare counter, sprinkle the top with flour and divide into portions of ~872g. Round out the portions into rounds with a dough scraper and let rest one hour on the counter. Do a final shape by flouring the rounds and flipping the rounds over on a lightly floured counter. Gently stretch the dough out into a circle. Pull and fold the third of the dough closest to you over the middle. Pull the right side and fold over the middle and do the same to the left. Fold the top end to the center patting out any cavities. Finally stretch the two top corners and fold over each other in the middle. Roll the bottom of the dough away from you until the seam is underneath the dough. Cup your hands around the dough and pull towards you, doing this on all sides of the dough to round it off. Finally spin the dough to make a nice tight boule. Sprinkle rice flour in the bannetons. Place the dough seam side down in the bannetons, cover, let rest for a few minutes on the counter and then put to bed in a cold (38F) fridge for 10-11 hours. The next morning, heat the oven to 475F with the Dutch ovens inside for 45 minutes to an hour. Turn out the dough seam side up onto a cornmeal sprinkled counter. Place rounds of parchment paper in the bottom of the pots, and carefully place the dough seam side up inside. Cover the pots and bake the loaves at 450 F for 30 minutes, remove the lids, drop the temperature to 425F, and bake for another 17 minutes. Internal temperature should be 205F or more. Interesting that these were baked at the 11 hour mark and they are a tad wider and flatter than the first batch done after 10 hours of retardation. The sweet spot really is between 9 and 10 hours for my fridge. Do your days have more hours than those of mere mortals? 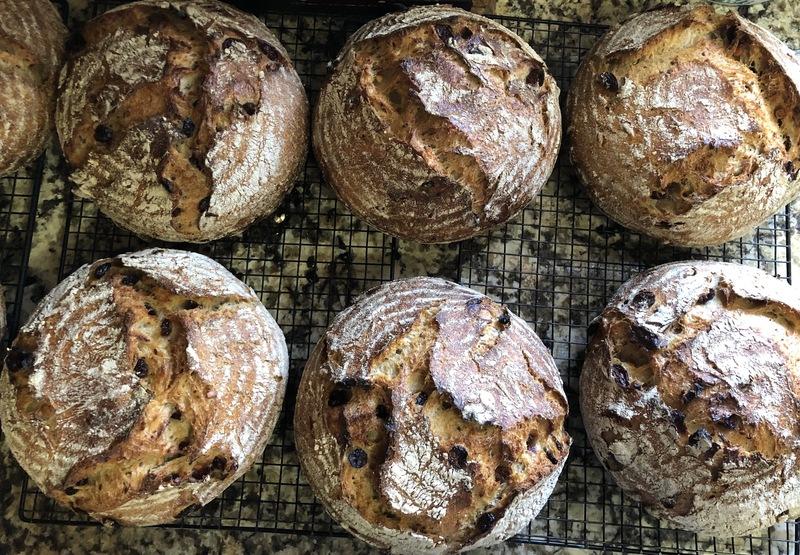 And always perfect loaves, full of all kinds of goodies -- and write-ups that make it sound doable. Finally, you answered the question I had in mind! It's quite crazy to bake 60 loafs in weeks yet it'd be totally insane if you have enough freezer space for them! I started working on Xmas dinner loaves as we are having an early Xmas dinner this year. I decided mid afternoon that I needed to get those out of the way ASAP as I will have my hands full making paupiettes, chocolate melting cakes, raspberry coulis and crème anglaise on Firiday. I really don’t need to add bread to the load. So it is going to be a bit rushed in the morning as I usually do my prep the night before but I was out playing cards with friends and am getting home too late. The Levain is on its second feed so CedarMountain’s Grass bread is getting made tomorrow and baked Monday. Thank goodness for freezers!